A long line of students stood waiting in line for for food and chatting at the Neal-Marshall Black Culture Center on Wednesday at the Mid-Day House party. The monthly event takes place all around the second floor of the NMBCC. Students line up for the food buffet and sit with friends and other people at the event. The event is also an opportunity to talk to staff from the center. This was the first Mid-Day House party of the year. NMBCC Director Monica Johnson said this is the purpose behind the event. “We just want students to come, get some food and be yourself,” Johnson said. The food is a drawing factor for students at the event. Junior Keira Bible said she came for the free food, among other reasons. Junior Sydney Smith, who has come to this event in previous years, also said she was interested in the food but came for the atmosphere at the NMBCC. 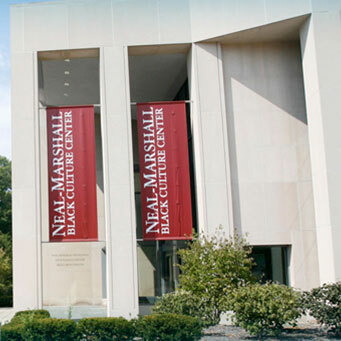 Smith said being at the Neal-Marshall Center is like being at a home on campus. At these events, Smith she often comes with friends but also gets to meet new people. Bible said she feels similarly about the event. She said Mid-Day House parties have a very welcome, open and family-like environment. Johnson said that the Mid-Day House Party is a great way to see a lot of students and develop a community. “People get to connect with other folks that are not in their schools,” Johnson said. Smith said too that the event is important because it is a good way to de-stress during a busy time of the school year. “If you have exams, you can come wind down for a bit,” Smith said. The Mid-Day House party may not encompass the typical characteristics of a college party. However, it is a place where students come together to enjoy food, take a break from their days and participate in the sense of community created at the NMBCC.